1. Place the farro and apple juice in a small saucepan, cover and simmer for 20-25 minutes until the grains are tender and liquid has been absorbed. 2. 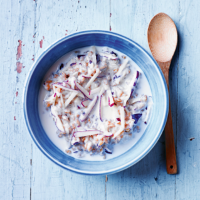 Stir in the grated apple and yogurt, spoon into a bowl and serve with the milk poured over.